The Indian Space Research Organization (ISRO) successfully launched a Cartosat-2 series on Friday which is weather observation satellite, accompanying 30 other spacecraft, using its Polar Satellite Launch Vehicle (PSLV ­- C40), which launched from the Satish Dhawan Space Centre (SDSC) at Sriharikota, Andhra Pradesh. “PSLV successfully launches 31 satellites in a single flight. ISRO’s Polar Satellite Launch Vehicle (PSLV), in its 42nd flight, perfectly launched the 709-kg Cartosat-2 series remote sensing satellite, along with 30 co-passenger satellites on January 12, 2018, from Satish Dhawan Space Centre (SDPC), Sriharikota,” ISRO added on Friday. The PSLV-C40 was successful in placing the Cartosat-2 series satellite in a sun-synchronous orbit, ISRO added. Friday’s successful take off comes about four months after ISRO’s PSLV-C39 was unsuccessful following a technical snag involving its heat shield. Prime Minister Narender Modi applauded ISRO scientists for the successful launch, saying the moment signified the country’s “bright future” in its space programme. “My cheerful congratulations to @ISRO and its scientists on the successful launch of Polar Satellite Launch Vehicle today. This approach in the New Year will bring benefits of the country’s rapid strides in space technology to our citizens, farmers, fishermen, etc.,” PM Narender Modi tweeted. “Profits of India’s success are available to our partners. 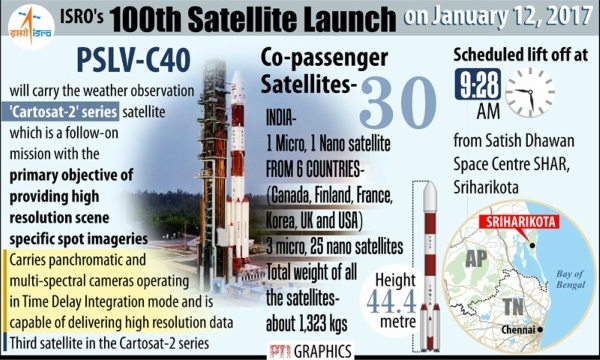 Out of the 31 satellites, 28 belonging to 6 other countries were carried by today’s launch,” Modi added. The PSLV has launched 51 Indian satellites and 237 satellites from customers abroad until now. “ISRO is beginning 2018 with the successful launch of our Cartosat small satellite, Nano-sat and Micro-sat and 28 customer satellites,” A.S. Kiran Kumar, ISRO’s outgoing chairman, said after the launch of PSLV. “The final launch of PSLV.. whatever heat-shield problems we had faced, the committees went carefully and then found corrective measures that were needed to make the system more powerful and today, what has happened indicates that the problem was properly understood and rectified, and we are highly happy to provide a New Year gift to the country,” Kumar said. PSLV-C40 launched at 9.28am and glide into a cloudy sky. 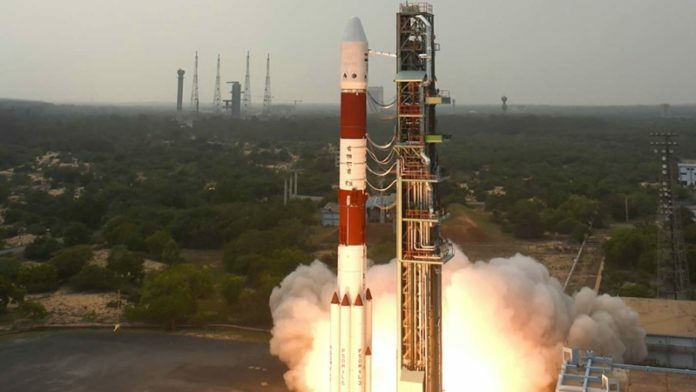 After a perfect flight sequence, each of which was congratulated by ISRO scientists, the four-stage rocket first injected the Cartosat-2 series satellite for earth observation into a 505-km polar sun-synchronous orbit for about 17 minutes after launching. Then, India’s Nano-satellite and 28 payloads from six countries, including the US and the UK, weighing 613kg were delivered into orbit one by one in a space of about seven minutes. The microsatellite made by ISRO was placed in orbit after PSLV-C40 was brought down to 359.4 km’s in a polar sun-synchronous orbit. The fourth stage was ultimately shut off at 2 hours 21 minutes, henceforth making the mission the longest ever by ISRO. What Is The Logic Behind Superstitions?